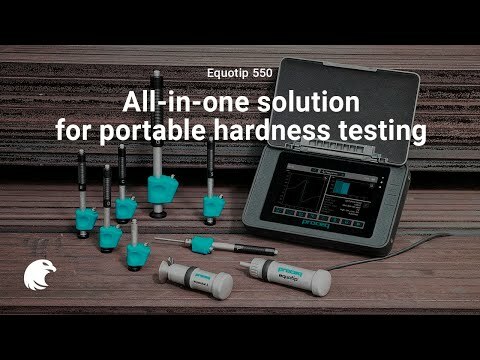 The Equotip 550 Leeb & Rockwell is the most versatile all-in-one solution for portable hardness testing, offering extended capabilities and unmatched ease of operation. This metal hardness tester has a large and clear display which is integrated in a specially designed housing for on-site usage in harsh environments. The Leeb hardness principle is based on the dynamic (rebound) method and is best suited for on-site testing of heavy, large or already installed parts. The Portable Rockwell test principle follows the traditional Rockwell static test method which is particularly suited for scratch-sensitive, polished or thin parts as well as for profiles and pipes. The new generation Equotip Touchscreen Unit offers an elaborated user interface designed by industry experts for increased efficiency and high experience. The enhanced software provides interactive wizards, automatic verification processes, personalization options and custom reporting. Furthermore, it is compatible with upcoming developments. The full color display allows best possible measuring and analysis of the measured data.